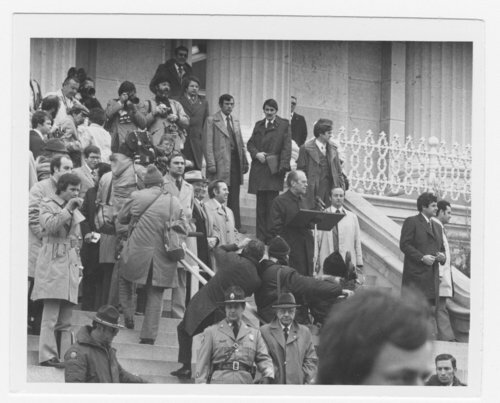 These four black and white photographs show the thirty-eighth President of the United States Gerald R. Ford speaking to an estimated crowd of 12,500 people on the east steps of the capitol in Topeka, Kansas. Prior to this address, he spoke to a joint session of the Kansas legislature about his economic and energy programs. Later in the day, the president met with ten Midwest governors at Cedar Crest for a working luncheon to discuss proposals for strengthening the nation's economy and reducing America's dependency on Middle-East oil.